Marigot is the French side of the magnificent island of St. Martin. Its amenities provide for one of the most exhilarating experiences in the Caribbean. Sailing buffs can join in a real race on a pair of multi-million dollar America's Cup Yachts, for a 12-meter "mini-regatta." Falmouth Harbour is on the south coast of Antigua close to Nelson' Dockyard in English Harbour. Falmouth is a quiet village surrounded by sugar plantations and mills with the main historic building of interest being St. Paul's Church which dates back to the 17th Century. On the eastern side of the bay visitors will find excellent shops, restaurants, and a marina. Falmouth offers a host of beaches including Windward beach which is considered a sun bathers paradise. Frigate Bay is the name of the two bays located adjacent from one another on the island of Saint Kitts. The beach is a long stretch of golden sand, dotted with sea grape trees and swaying coconut palms. Some beach activities include windsurfing, kayaking, jet skiing, and volleyball. For visitors looking for nightlife you can't beat Mr. X Shiggidy Shack Back, which boasts a lively crowd, live music, dancing and a bonfire on the weekends. Saba is one of the Leeward Islands in the Caribbean, located to the south of St Maarten and north of St Kitts. It is part of the Dutch Antilles. Saba is mountainous and has tropical rainforest. The Dutch took possession of Saba in 1632 and apart from a period during the Napoleonic Wars when they fell into British hands, the island has been under the jurisdiction of the Netherlands ever since. 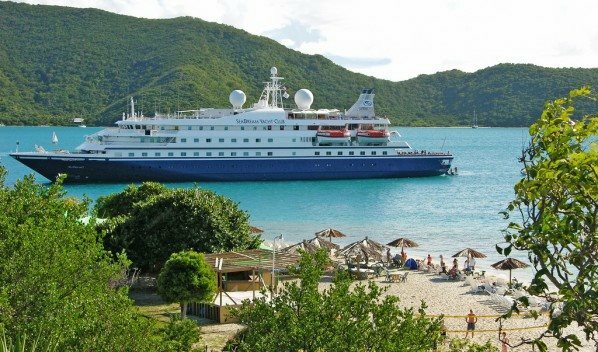 There are many ways to hunt for treasure in St. Thomas. You can discover its historic wealth in such places as the birthplace of painter Camille Pissarro or the infamous Bluebeard's Tower. Its sporting riches are tennis, golf, sailing and incredible beaches. Beneath its crystal-clear waters, you'll find coral gardens and shimmering schools of jewel-colored fish. Its fortune of earthly treasures can be found in the many shops of Charlotte Amalie, where savings on jewels, crystal, perfume and fine wines will arouse your hunting instincts.